It's here! On Tuesday afternoon, at 1 p.m. EST, Apple will kick off its iPad launch event in San Francisco, Cali. — and we're live-blogging it to you straight from Bustle. We already know that the refreshed iPad line will get faster, thinner, and sharper, and that the invitation’s tagline — “We still have a lot to cover” — implies that the iPads will come with a brand-new keyboard cover, turning your tablet into a tiny computer at a moment’s notice. Whispers have been flying that Apple will also unveil one or more of: OS X Maverick, a “smartwatch,” and/or a reconstructed Apple TV. Tim Cook and co tend to launch their big-deal products in the fall, meaning that we can expect pretty much anything from Tuesday's event. 2.23: "Other companies would be incredibly proud to have just one of these products." 2.20: New covers are getting into the game, "because customers love to protect their iPads." Well. Customers have a deathly fear of breaking or scratching a tiny one-pound machine. They're really getting into this "rainbow" thing, eh? 2:18: Aaand, there's an iPad Mini with Retina display. It also comes in four shades, and it'll start at $299. 2:17: They're playing a classic iPad video: white screen, developer explanation. 2:14: The iPad Air will start shipping Nov. 1. China is one of the first countries to get it; Apple's certainly not messing around with the heavy share of its market that is China-based. It comes in FOUR COLORS: silver, white, gray, and black. It's $499, and $629 with cellular technology. The above is a prankster. We highly doubt this is the case, but fingers crossed. 2.09: Good Lord. It's named the iPad Air. It's 43 percent thinner than the previous version. It also has a Retina screen. It's 7.5mm thin. OK, that's pretty thin. It's also very light: one pound heavy. That's the "lightest full-size tablet in the world," apparently. 2.07: "We've taken the biggest step yet in the vision that is iPad." "We now have over 475,000 iPad apps on the App Store. These have been customized for the iPad, not these stretched out smartphone apps that our competitors are doing.” Burn. 1.58: "We are turning the industry on its ear." Does he mean its head? "Next up: iPad!" 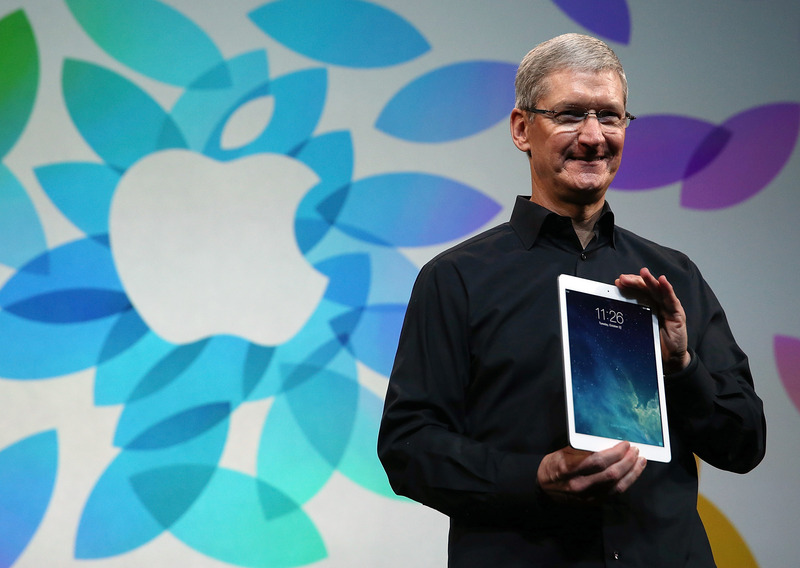 "Earlier this month, we sold our 170 millionth iPad." 1.57: "The biggest updates ever. And all free. I hope you can see why today is the biggest day ever for apps." 1.55: It's easier to share documents with people via iCloud in iWork. The developers are sending documents to one another on-screen. 1.52: Apple throws around the phrase "rewritten from the ground up" a lot. Also, spreadsheets have "gotten even better." Fun! 1.51: All of those updates are free, and available today. 1.48: Garage Band has also been rebuilt, with the inclusion of a drummer track. You also have your own drummer who plays at will, named "Kyle." Huh. OK.
1.46: There's a new feature called iMovie Theater. It's available across all of your devices, and organizes your homemade video. 1.44: iPhoto has been completely rebuilt, says Cue. You can now print your photos from any device. iMovie has also been redesigned — "cleaner, simpler, for iOS 7" — with the aim of making it simpler to shoot and share your videos, whether you're on an iPhone, an iPad, or your laptop or desktop computer. 1.42: After a cutesy little "how it was made" video, we're back with Schiller. He hands the reins over to app-man extraordinaire Eddie Cue. 1.39: Apple used engineers across 20 states to build the Mac Pro, which may slightly justify the price tag. Slightly. "It cuts my editing time exponentially." "It will change the way I make movies." "It's blazing fast, and shockingly quiet. You have to not hear it to believe it." "You'll be super impressed with this pricing," Schiller maintains. Um. Sure. 1.35: "It's ten times faster than a hard drive, if we put one in." Hard drives are so 2008 for Apple. It still looks a bit like a glossy car part. 1.34: "People have been blown away by this incredible new design." Again, Apple is not known for its modesty. It's one-eighth the size of its previous model. Woah. It has the fastest processor Apple has ever put in a Mac, says Schiller. It also has the fastest memory. 1.33: "And that's our news for MacBook today," concludes Phil Schiller. And it's time for Mac Pro. 1.31: The 15-inch MacBook Pro is here, too. It has 8 hours of battery life, faster WiFi, Thunderbolt storage, you name it. Its old edition started at $2199; this one starts at $1999. It, too, starts shipping today. 1.30: The new 13-inch MacBook Pro is here. It has up to 9 hours of battery life, and you could, hypothetically, watch the "Dark Knight" trilogy without having to charge. It starts shipping today, and it's $200 cheaper than its old incarnation, at $1299. It has 4 GB of memory. "The greatest laptop ever made," appears on the screen. It's a review. It's time for the MacBook Pro. 1.27: Maverick is available today. "Go out and get it." 1.26: "Free is good," he adds, after applause. 1.25: "For the last several years, we've been on a mission," Federighi says. "Upgrading your OS is as easy as downloading an app from the Mac App Store. Today, we announce a new era for the Mac. Today, we announce that Maverick is free." 1.23: The Maps app is smoother, cleaner, and syncs to all your devices. It looks pretty awesome. 1.21: Federighi just showed his credit card number to the Internet. "You don't have my security code," he added, without ever breaking stride. Right. 1.20: Federighi demonstrates how you can message, say, your wife (HAIR FORCE TWO?) in Maverick without ever having to leave the application, or click through to a different screen. 1.18: You can put all your content under different tags, meaning that all your "Mars content" — because who doesn't have Mars content, Federighi?! — can be in the same place. 1.16: Mavericks doesn't have a different interface, but it does make moving from notification to applications far smoother, and can handle more memory. Cook hands over it to the software developer, Craig Federighi, for a demo. 1.12: Finally: OS 10 Mavericks, the successor to Mountain Lion, is Cook's next talking point. "You can run more applications, and never slow down," he declares. 1.11: Cook's impression of his competitors. Ouch. Sorry, Microsoft. 1.10: Commentators on CNET are wondering where on earth these new products are. 1.09: Cook moves on to iTunes Radio, one of the most competitive features of iOS 7 and the successor to Pandora. 1.08: Now, Cook is lauding the success of iOS 7: 64% of compatible devices are running iOS 7, he claims. “It blows away the other guys.” Cough. Android. Cough. 1.05: Cook kicks off the talk by discussing the iPhone. "It was the biggest iPhone launch ever," he said, citing the oft-quoted statistic of 9 million iPhone sales during the first weekend. 12.51: To rev up for today's event, here's Bloomberg's take on why the iPad is Apple's most important product to date. 12.43: Apple is live-streaming today's event, which is unusual for the company. You can watch live video here. 12:32: People are filing into San Francisco's Yerba Buena Center for the Arts Theater, where Apple is holding today's event.